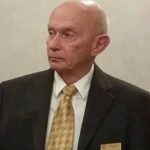 I wish to congratulate the new members and I offer my sincere thanks to our outgoing President, CAPT Bill Tate (ret), for his outstanding leadership over the past two years along with his invaluable assistance in helping me transition to this new position. I also wish to thank LTC Cal Taylor (ret), our outgoing 1st VP/Membership for his essential work in all facets of membership, but especially for putting us on an upward trend in gaining new members. 2018 will be an exciting and significant year for the Central Ohio Chapter. Our mission of “Taking Care of the Troops through Legislation & Support” must be our priority and we’re doing a good job of accomplishing this mission. We do this through direct financial support to such programs as Honor Flight, Veteran Stand Down, Adopt-A-Service Member, Veteran’s Court, and thru numerous other venues such as our Legislative Affairs, Personal Affairs, Cell Phones for Soldiers, coordination with the Ohio State Council of Chapters, and MOAA National. You, as a member of the Central Ohio Chapter, are contributing to accomplishing this mission. We will have challenges in 2018. I see three immediate challenges: (1) increasing chapter membership (2) maintaining a sound financial position (which we have now) while we increase support to veterans and (3) determining how we can be more effective and efficient in accomplishing our mission. I’m sure there will be others. I have no doubt these challenges can be met, and we will continue to excel. I base this on four facts. First, we have the most amazing people I’ve seen collectively in a long time: the membership has extensive experience and expertise, we’re diverse – all branches of service are represented, and we know how to overcome obstacles and “win.” Secondly, we’re focused on the right mission. Thirdly, we’re in a great location. Central Ohio attracts new people and abounds with resources to help us; resources such as educational institutions, nationally known businesses, and a population that traditionally supports veterans. Lastly, we each have the desire to do all we can for the troops and veterans. I am very honored to have this opportunity to be President of such a fine organization. A team working together focused on one mission is the path to success! What’s on Your Mind – I want to hear what’s on your mind, and if you have any concerns about our Chapter or suggestions to improve what we do, please get in touch and I’ll make certain we consider your suggestions and try to correct any problem. Call me at cell phone 571-217-8897 or email me at SharTom123@AOL.com. Board of Directors meeting at noon on Wednesday, February 7 at DSCC (Building 11, Section 9, Rm TBD). Monthly Luncheon and Business Meeting at noon on Friday, February 9 at the Berwick Manor Restaurant, 3250 Refugee Rd, Columbus, Ohio.